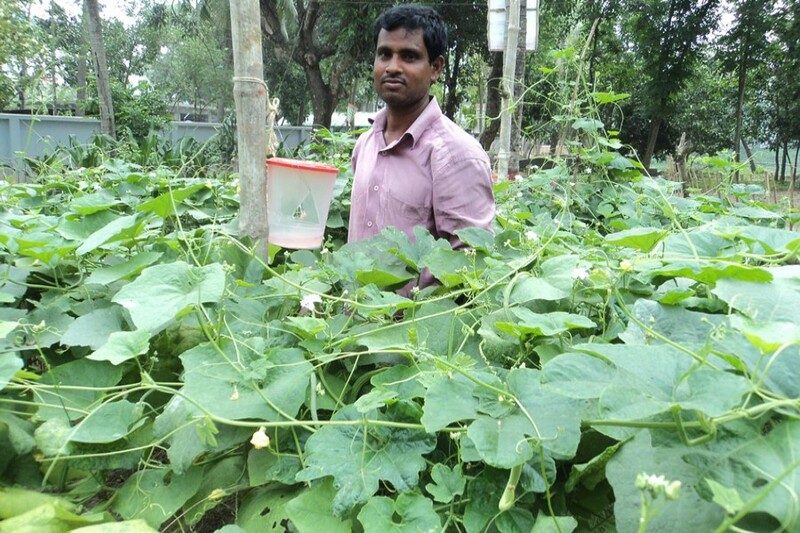 BOGURA, July 11: Pheromone trap is smoothly boosting fresh vegetable production in Bogura district. Meanwhile, by dint of the method the farmers are being succeeded to reduce production cost as a result its gaining momentum across the district. The method is saving Tk 500 to 1,000 for a bigha of land and keeping the crops danger free from toxic. The farmers have shown more interest to use the method in the crop land as they have been suggested from the local agricultural offices across the district. Department of Agriculture Extension (DAE) office source said the farmers of the district have brought over 12,500 hectares of land under different short duration vegetable in all twelve upazilas of the district this season. Among them some 500 hectares of land have been brought under the method in Dupchancha, Kahaloo, Adamdighi, Sariakandi, Sonatola, Dhunot , Shajanpur, Gabtoly and sadar upazilas of the district, DAE added. "I have cultivated lucrative Jhinga farming on 33 decimal of land using pheromone trap instead of chemical pesticide," said farmer Golezan Hossain, 56, under sadar upazila. He also said, "The crop land looks very beautiful as massive pest attack on the farm is not appeared yet." The farmers set up the trap in the corner of their vegetable filed. The injurious peats fall down in the pots and die easily. As a result they can't speed their kids rapidly. "I use the method in my 23 decimal of okra cropland this season and get a good result," said farmer Hisam Uddin, 60 under Kahaloo upazila. Upazila Agriculture officers of the district said we encourage the farmers to use the method instead of spraying pesticide to get a chemical free vegetable. The farmers have also shown more interest to use the method and saved extra production cost, he added.